​re-interment of The Cremated Human Remains exhumed from the Temple in 2008. 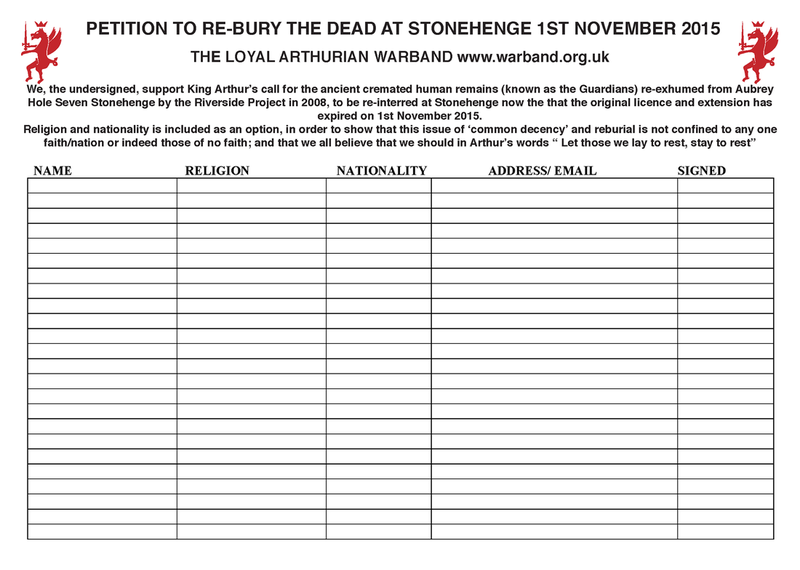 On Sunday 1st November 2015, the Warband and supporters up and down the UK and the world*, will be collecting signatures on the petition below. All you need to do is download and print off the petition below, find your local museum and gather signatures on the day. You can find out up-to-date information on the Facebook page, join in with a group at a museum or stand alone - every signature counts. Robe up and take banners if you wish but be there! After a recent poll in the Western Daily Press where 93% of their readers voted against displaying the dead and only 7% in favour of, the views expressed and the best efforts of The Archaeologist in a white frock; We see that yet again EH are out of step with their outdated research and claims that People wish to see the genuine remains on display; As was also borne out by other more recent polls Source. Overheard at a Museum recently, a child asks the following question when viewing the skeleton remains of long dead and departed children.
" Did they do something wrong? were they naughty mommy? Is that why they were not buried like everyone else?"